Ward 5 may claim to be a “dumping ground” for that which the city does not care for elsewhere: strip clubs, marijuana cultivation, and parole facilities, but that same industrial character has given rise to a new phenomenon that’s much more palatable: breweries. This past Saturday, DC saw its only two truly local breweries open their doors for “Growler Hours” for the first time. Named for the 64oz jugs, Growler Hours are an opportunity for local institutions to sell their product directly to the public without going through a distributor, or needing a full bottling operation. Growler Hours are a recent development in the District, thanks to DC Brau, the first of the city’s new brewing culture, who worked with DC ABRA to identify the conditions under which growler sale is legal (i.e., heat-sealed containers, not to be consumed on-premises), which has paved the way for others to move forward. 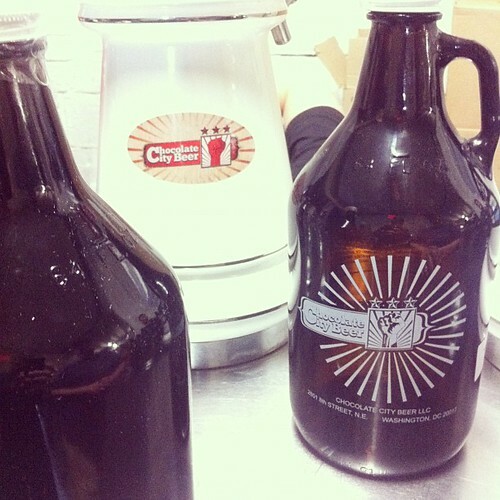 Growler Hours allow for a brewery to raise some quick capital to put back into their business for new brewing supply, as well as build some customer loyalty with friendly atmosphere for camaraderie with the brewers. Saturday’s events at DC Brau on Bladensburg road near the District line felt more like a gathering of extended family members more than anything else. DC Brau’s friends at 13th Street Meats were out manning the grill and providing tasty eats to go with small tasting cups of their four different brews. Tours of the Brewery were on the half hour, taking the group past the mash tuns, the fermenters and the canning line. Friends and family were gathered in a social atmosphere with the brewers themselves, talking about malts and hops, and relaxing on a Sunday afternoon. The scene at Chocolate City Beer, which held its first Growler Hours this past Saturday was a bit more cramped, though it was their very first public Growler Hours which played a part in that. Their facility is about half the size of DC Brau’s, and parking was a lot more of a challenge. While Chocolate City doesn’t yet have a tasting license, and couldn’t pour samples for anyone, that didn’t stop them from filling at least 30 growlers with their Cornerstone Copper Ale in their first sixty minutes or so. When we arrived, there was a small gathering, but it turned quickly into a line out the door of the oddly shaped building beneath the Franklin Street bridge on the eastern side of Edgewood. Right now, it’s possible to do the whole DC Beer tour in just two stops, but two more entrants into the local brewing arena are hard at work on their spaces: 3 Stars Brewing in Ward 4 on Chillum Place, and Low Brau which is looking for space in Northeast DC. 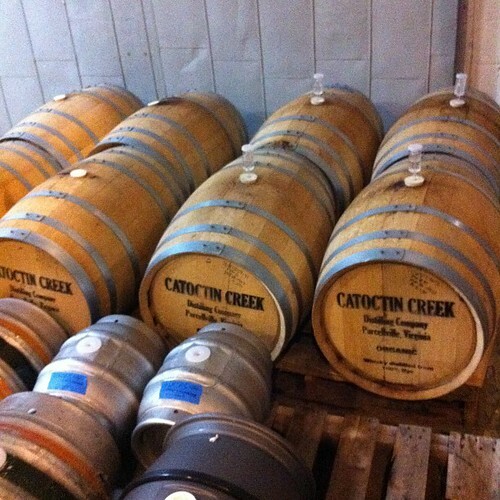 Come 2012, DC could sport four local brewing houses providing quality beer for your taps across the city. Currently, DC Brau is on tap throughout the city at certain locations, while Chocolate City Beer is still working on their distribution. There’s a lot of strength in drinking local, DC, get on that. Consider heading out for the next Growler Hours at your local breweries. They tend to be Saturday afternoons, when it’s easy to meander through town and set a spell after having a tasting cup. Watch the Twitter accounts for the breweries for announcements on their next open events. So cool. I can bike there, pick up a growler and head home.